All seems fine then. Assuming others have updated the 5050 and the file works i can't think of much else. Corrupt file download or unzip fault, may be worth a second go but we're into unlikely realms. Just the .bin file on the root of a blank fat32 drive should do it. Certainly be interested in how it gets sorted for my FAQ! Yes, thanks again Alaric, will let you know when I have it sorted out. Man, this should not be this hard. I even created a 100mb partition on the USB key, no other partitions on it. The firmware file is EPSONPJ_t5ul.101.bin and it is in root. By default format creates a hidden “System Volume Information” folder and I tried with and without that. Still the same. Just endlessly flashes the three lights. Has anybody else been successful with upgrading the firmware on the US 5050UB to 1.01? Movies trade blows but right now I’d give edge to BenQ because just how dead simple it is to get the picture I like with auto HDR. I was about ready to pull the trigger on the 5050 but this is one thing that gives me pause. I'll use it mostly for movies; I just want to throw the disk in and go, not have to screw around with settings for each movie. I seem to remember the new disk players coming out from Sony and/or Panasonic have auto tone mapping (I don't even know what tone mapping is), but I could be wrong on that. Thanks. I certainly hope you solve this soon. For the sake of others it would be helpful to hear what Epson has to say about why you are having the update problem, and it would be helpful to many of us to hear what Marantz/Denon has to say about the signal/cable issue. Thanks and good luck. I have a 5040UBe combined with a Panasonic DP-UB820 and once I had it set up the way I liked I have never had to change my settings. I assume the 5050 would be the same. Still stuck on the firmware update issue. I suspect it’s that Windows keeps rewriting the System Volume Information folder to the USB key before I remove it from the PC so it’s confusing the Epson. Tomorrow I’m going to try and write the file to the same key using MAC instead of Windows and see if it changes anything. As for the signal issue I think I just solved it. Fingers crossed it doesn’t happen again but I think I figured out what to do if it does happen again. What I did was eliminate the Marantz from the picture by removing the HDMI cable for each source device. Then I plugged my Optical extender directly into each device one-by-one, making sure the HDCP 2.2 light on the extender lit up. Then I inserted the HDMI cable for that device back into the Marantz and then the extender into the Marantz. One by one every device lit up, so now they’re finally all working. Looks like it was an HDMI handshake issue. Since I am replacing a 4050 with a 5050 maybe the HDMI signals got screwed up and I just had to reset them by doing that process. Whatever it takes. All good now so going to enjoy. Will let you know if it comes up again. Thanks for your interest! Alaric and JonfromCB like this. Some enthusiasts represented here strive to maximize performance...either by personally experimenting and tweaking or by professional calibration...it's the nature of the hobby for some. On the other side of the spectrum, I would venture to say there are also enthusiasts here who take the PJ out of the box and never or minimally touch adjustments...and are perfectly happy. And likely, others are somewhere in between. The question is do you adjust brightness, contrast, and color for each movie or program when watching your TV/flat panel? Or do you set it and forget it? 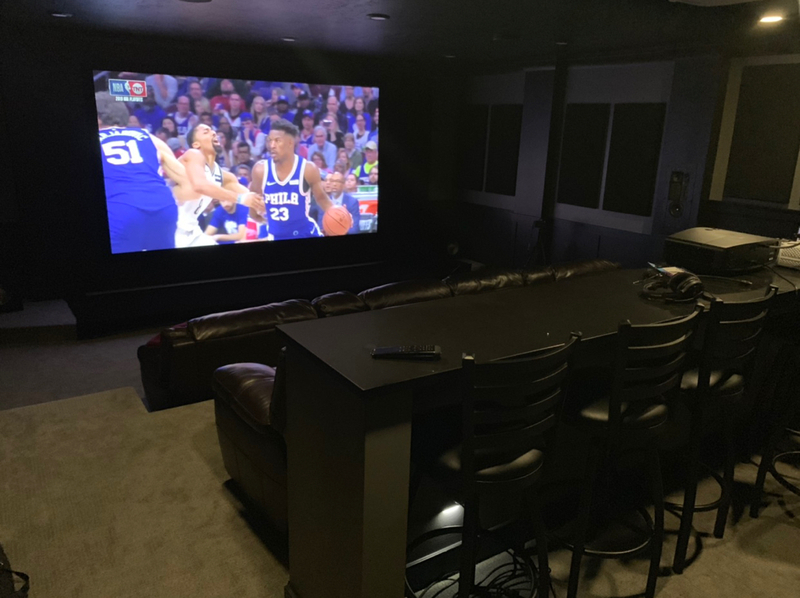 Bottom line, this hobby affords something for everybody and to each their own...there is much to like about projectors...the 5050 is no different. Relative to tone mapping...simple explanation....some HDR content tends to be too dark...some players have a "slider" that adjusts overall image brightness. WynsWrld98, JonfromCB and BIC2 like this. I'm probably going to do a 125"-130" diagonal 16:9 screen. Dedicated, completely dark theater. Throw distance can be 15-18 ft or so. First row (MLP) about 12 ft, second row about 16 ft. Would 0.9 gain spandex be a good choice to go with the 5050? If not, any recommendations for a suitable AT screen? Thanks. Is the 6050 available? Any MSRP? Thanks. Unfortunately that fix was short lived. Next time I powered everything up every source was again unable to connect. At this point I have switched to using a 24 foot HDMI cable temporarily (works fine) while I work with the vendor of the optical extender to figure out what's happening. I am in need of some advice please. I just got my UHZ65 over the weekend and have been testing it in my non-dedicated theater room with a 125in SI Slate screen. The projector is about 13feet away from the screen. So far I am impressed with the picture quality. I currently own a Sony HW65ES projector. The difference in contrast and picture quality is significant. However, I do notice a significant lag with the UHZ65 when I game. This was expected as I knew the lag on the UHZ65 is 80ms compare to my old Sony HW65ES at around 30ms. 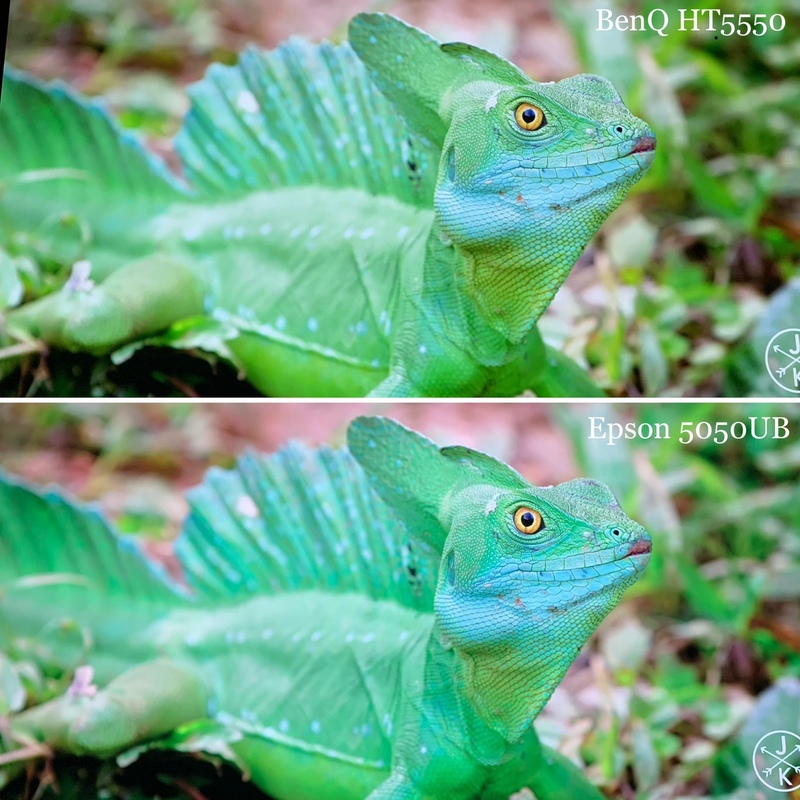 I am thinking about maybe getting the new Epson 5050UB to test it out and see how it compares to the UHZ65. I understand the technology is quite different (laser vs lamp, DLP vs LCD? ), but as long as the picture quality is just as good on the Epson, then I might switch to the Epson due to potentially lower lag. (I can't find the lag time for the 5050UB but I think i read somewhere the lag for the 5040UB was in the low 30s so I am assuming the new 5050UB shouldn't be too far off). Can someone help me decide whether of not they think the 5050UB would be a good alternative to consider. Thanks! 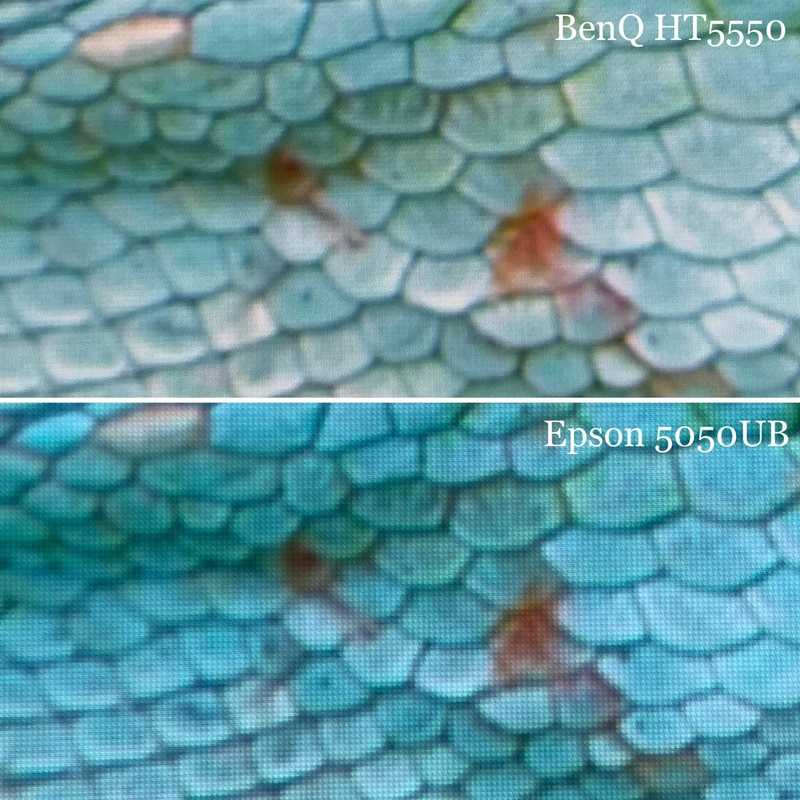 I know that without doing the modification to your projector outlines by TVS Pros I believe the Epson hits more of the HDR color space and potentially has better contrast. If the filter is installed from what I have read it’s fantastic but almost double the price of the Epson. The lag if I remember is around 28. Thanks again. How does your Xbox one X do as a 4k bluray source for your Epson? Recommended or should I just get a dedicated bluray player? thanks. I still don't have the new Epson. I get that tomorrow night but I have taken the Xbox out of the equation long ago. yes, it plays a 4k disc that is that. It does not do it well, and I often had audio drop outs for a hot second when playing discs only. I purchased it to do a little gaming which I didn't end up doing often enough and to get Atmos support through the Netflix app. I will be picking up a Panasonic UB 820 when I get my Epson tomorrow. I feel when spending this kind of money, I should make sure I pair it to fantastic player which the Panny is. I will not bother wondering if there is any more performance left on the table. It also provides the option to do tone mapping with its HDR optimizer function which has been highly reviewed. As a bonus it provides Neflix and Amazon apps which support Atmos and 4K HDR. So I will gladly spend the extra $500 to get PQ that rivals or surpasses an Oppo and adds streaming apps to boot. I ended up ordering a new 5050UB last Friday to replace my Vivitek HK2288, which is only a year-ish old. Don't like sending in the Vivitek for firmware updates (in fact it's out for one now) and I see rainbows with it too. I was looking at the 5040 when I bought the HK2288 and opted against it because there wasn't an 18GB connection for my XB1X. Since the 5050 fixed my complaint about the 5040 and my Vivitek has been off site for over 10 days now, I pulled the trigger. My 5050UB shows on Wed, very much looking forward to it. germanplumber and CallingMrBenzo like this. I've got mine on order from Best Buy. Should be here by the 23rd for pickup. I have not been on an Epson thread in years even though I own and still use a 6010. But, its time to upgrade and was about to buy a JVC 790 which really does seem like a great deal at its lower price. But now with the new Epson out its got me wondering. The JVC has always been highly regarded but there are complaints about varied amounts of E-shift buzzing noise which concerns me. Have any of the Epson shifters ever suffered from anything similar? Price points are close enough for me to consider either one but hate to get a noisey JVC and potentially have issues getting a replacement this close to the reported end of its production. These new Epson sound very good for the money also. 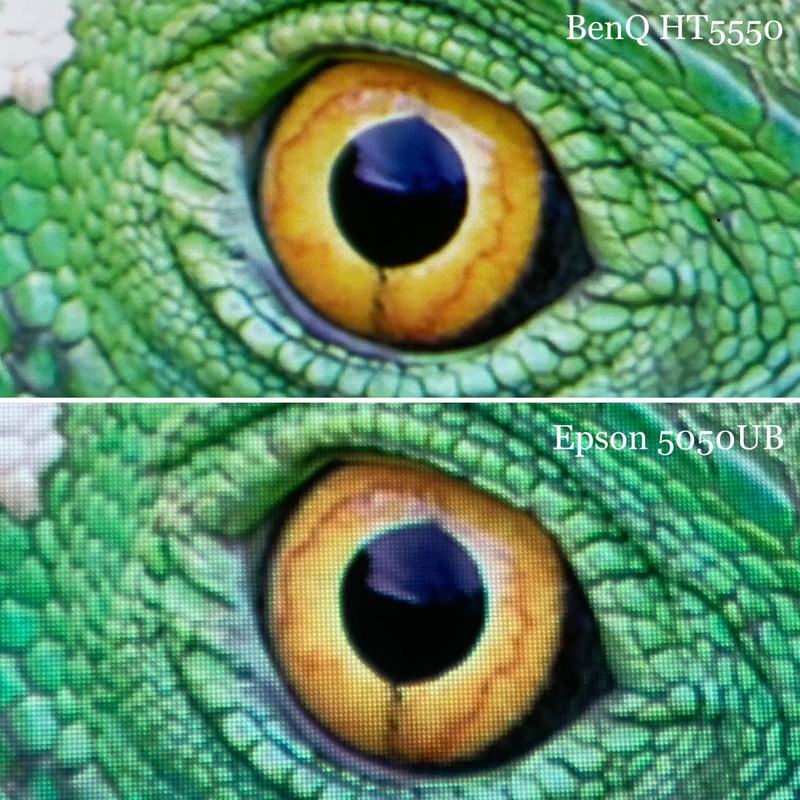 So I’ve been doing some more prep work for my shoot out with the BenQ HT5550 and thought this would be an interesting share since 1) I am on record for not recommending the HT5550 for sports (foot now in mouth) and 2) I still can’t get past that I can see pixels from 16 feet away on my 160” screen. Call me crazy. A member here known as Kraine reviews for a site called passionhomecinema.fr and he posted his review of the HT5550 today. I used his settings in the User mode and a new veil was lifted for use of the HT5550. Nearly 1500 lumens of color accurate image, within a margin of error of the 1800 or so good lumens from the 5050UB. Picture of the theater and the HT5550 playing with my back half completely illuminated. And some shots of the projectors in action. The Epson is in Alaric’s recommended settings and the HT5550 in Kraine’s (love our community). 4K enhancement is on - image preset 2. GlenH and CallingMrBenzo like this. Good pics. If you need to zoom in that much to see pixels, I think the majority will be very happy with the 5050, especially with better blacks/contrast. Question - are the pixels visible with the naked eye up close with 4K enhancement on, or is that just the camera capturing what it sees in a split second that isn't visible to the naked eye? True for most. However those who a) are coming from a True 4K projector and b) have good eyes, will notice. Coming from 1080p or the 5040? You’ll be happy. If you think you meet both criteria, chances are you need to see an eye doctor because I can most definitely tell a difference. And while you make a good point, what is the point of 4K then? Especially as screen sizes are trending towards bigger and viewing distance preferences trend towards closer to screen? My question is rhetorical... I don’t want to debate that here. Haha I will just continue to beat my drum. Don’t mind me. There's also the matter of cost for the price conscious -- whether it's by choice, resources or by force (WAF) \o/. Not sure who would be coming from a true 4K projector to a pixel shifter, unless it's for the increased brightness for HDR. Bottom line is that people will decide based on what's important to them and what isn't. There's no wrong choices. Assuming that’s a 4K source? Since most sources are 1080p, does the 4K enhancement make the image softer like the prior models? Per CTA HT5550 is ‘True 4K’, Sony 295ES is ‘Native 4K’. Pictures above are of a True 4K 1080x4 shifter vs a 1080x2 shifter. 4.1M pixels vs 8.3M pixels. Some will prefer the blacks and input lag of 5050. Some will prefer the higher resolution and motion handling of HT5550. Hopefully all this info is to help people make a decision they’ll be happy with. This is of a 4K source, yes. Many reviewers of the 5050 say that the 4Ke has improved vs last gen and to just leave it on the whole time. I agree. Per CTA HT5550 is ‘True 4K’, Sony 295ES is ‘Native'. Ah I see, I presumed "true" and "native" were synonymous. WynsWrld98 and Alaric like this. Cool. I’d love for you to do some 4ke on and off for common blu rays with those same grade photos!